"Chelsea's first choice goalkeeper refused to be substituted against Manchester City and I've seen it in South Africa before. What can be done to avoid such incidents?" says Eggs Benedict. 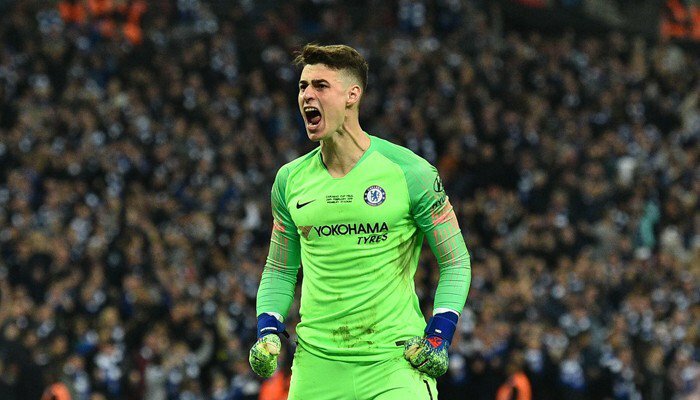 The 24-year old Spaniard went down twice in extra time clutching at his hamstring and Maurizio Sarri wanted to replace him with Willy Caballero for the penalty shoot-out but he blatantly refused to go off. Incidentally, Caballero is a penalty specialist and could have helped his team win the shootout. The act of defiance wasn't a great sight and the officials didn't know how to handle such a rare occurrence. In South Africa, we had a player called Gora Ebrahim who played for Rabali Blackpool that refused to be substituted in the first half. When coach Walter Rautman took him off the next time the ball had gone out of play, he decided to karate-kick him on his way out which landed the Austrian-born mentor in the hospital with broken ribs. We've also seen Carlos Tevez refusing to be brought on by then Manchester City manager Roberto Mancini with a few minutes remaining. Mancini ended up having to publicly declare that he would never ever field the player again. With all these incidents having been mentioned, how could we better deal with the situation as it occurs in the match? Come to think of it, the officials have wasted their precious time and energy preparing the paperwork, raising the board and waiting for a defiant player to abide by the rules but they don't have means to punish them at that point in time. No player should be bigger than his coach, team, fans and officials. The referee should be able to send such a player off. The team dealing with the situation afterwards should be another story. ALSO READ: What is wrong with Chelsea?